I'm not sure exactly why but Logan is obsessed with zombies! He talks about them all the time and seems to quite like the idea of them. He certainly doesn't find them scary at all and wholeheartedly accepts that they like to eat people's brains... So when I was asked if Logan would like to review a copy of Zombie Dice Deluxe I jumped at the chance. Here's what we thought. 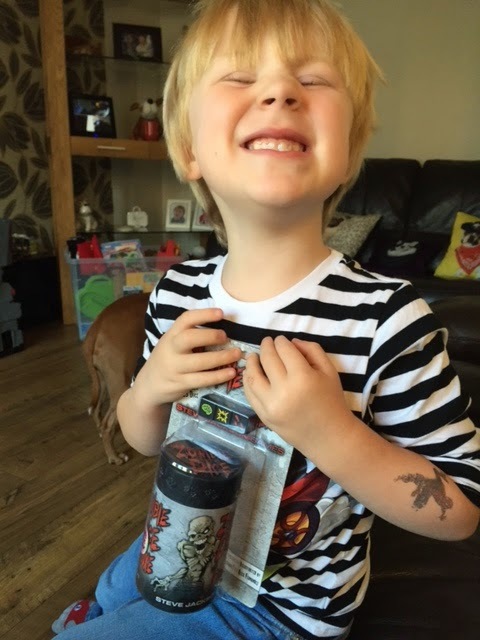 Zombie Dice Deluxe is aimed at slightly older children and adults (aged 10+) however even Logan (who's almost 5) got the idea of the game pretty quickly, even if he did cheat quite a lot haha. 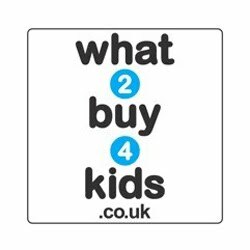 It comes packaged in a simple blister pack which you can rip open then recycle the plastic and cardboard after. 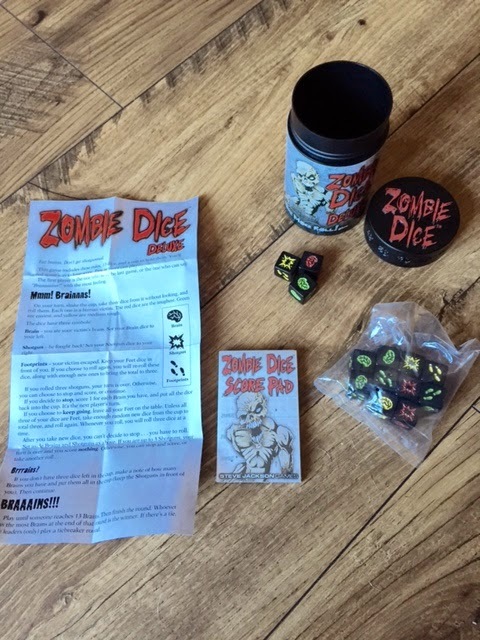 Inside the pack you get a handy Zombie Dice shaker cup, 13 dice in total (all custom), a set of instructions and also a little score card book where you can keep track of all the brains you've eaten. The 13 custom dice come in 3 different colours; green (easy), yellow (medium), red (hard). Each dice has a mixture of 3 different images on it. A brain (for eating! ), footprints (means your victim got away) and a shotgun blast (get 3 and you're turn is over with no brains). So the green dice is easy as it only has 1 shotgun blast on it, 3 brains and 2 footprints. The yellow dice is medium because is has 2 shotgun blasts, 2 brains and 2 footprints. And the red dice is hard because is has 3 shotgun blasts, 1 brain and 2 footprints. 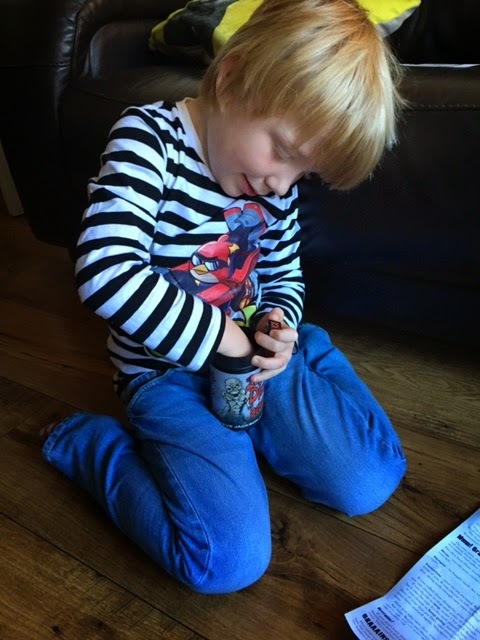 To play the game you put all 13 dice in the plastic Zombie Dice Deluxe cup, shake them up, pull out 3 (without looking), roll those 3 on the floor and see what you get. If you get 3 shotgun blasts your turn is over and you don't get to count any brains. If you get say 2 footprints and 1 shotgun blast then you keep the 2 footprints aside and pull out another 2 dice from the cup to make up 3 with the shotgun blast that you rolled, then roll again. You can keep going until you get 3 shotgun blasts on your roll or the dice run out. You have to roll with 3 each time and keep any footprints aside as those people got away and you couldn't eat their brain, hehe. If you manage to get any brains then you count those up at the end of your turn and mark it on the score card. This really is a great little game and after a few shots you soon get the hang of it. Each game can take around 10 - 20 minutes and the first player to 16 brains wins. You need at least 2 people to play this game, to make it fun anyway. 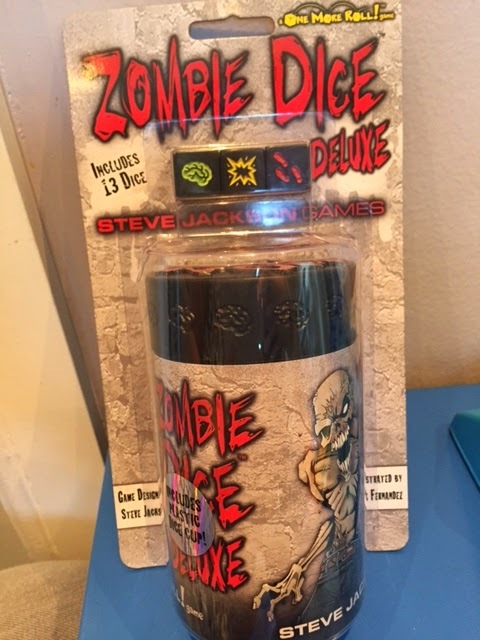 For clarity here's how Steve Jackson Games describes their Zombie Dice Deluxe game: "Zombie dice is a quick game for any zombie fan. The 13 custom dice are your victims. Push your luck to eat their brains, but stop before the shotgun blasts end your turn! Play at lunch oe while you're in line for a zombie movie! This deluxe version includes a score pad and the plastic zombie dice brain case. Eat brains. Don't get shotgunned.You are a zombie. You want braaains. 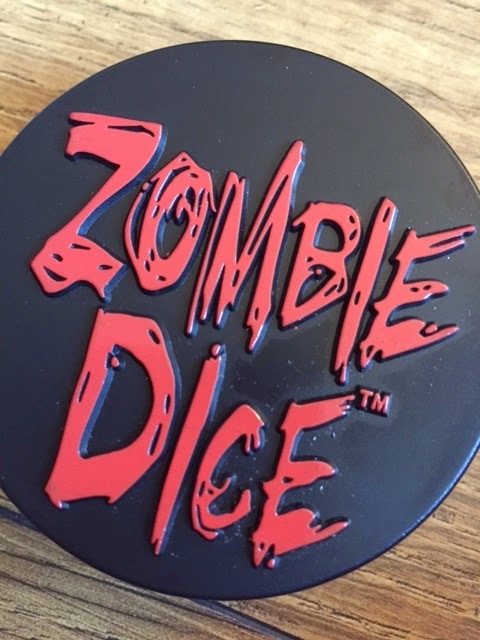 More brains than any of your zombie buddies.Zombie Dice is a quick game for any zombie fan (or the whole zombie family). The 13 custom dice are your victims. Push your luck to eat their brains, but stop before the shotgun blasts end your turn!Play it at lunch (braaiiins!) or while you're in line for a zombie movie . . . !" Logan loved this game and even though he cheated (he's allowed) it was really fun to play. 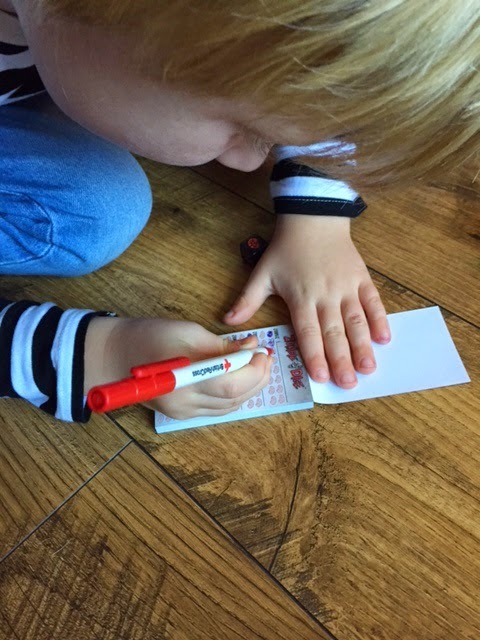 It helped him with his counting and also turn taking as well as learning to keep a score (even if it was in his favour). If you fancy your own copy of this great little game it retails for around £19.99 but can be picked up for a discount usually on Amazon. You can also pick up the normal Zombie Dice game (not deluxe) for a much cheaper £11.67 on Amazon. It just means you don't get the plastic cup. Great alternative Halloween gift though! I was provided with a copy of Zombie Dice Deluxe free of charge in order to complete this review. 1 comments on "Review: Zombie Dice Deluxe Set"